Marlow Yachts debuted two new yachts at the Fort Lauderdale boat show, including an updated version of its Marlow 97E and the new Marlow 80E. Called Miss BHaven, the hull No 5 in its 30.76m flagship Marlow 97E series offers a new design slightly customized. Indeed, her bridge deck was lengthened to extend the size of the skylounge. 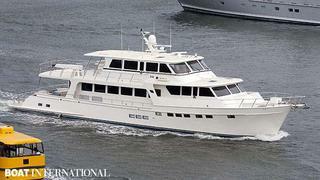 And she offers accommodations for 10 guests in five double cabins on the lower deck. Bureau Veritas registered with an 'unrestricted navigation' certificate, she's powered by twin Caterpillar C-18 engines giving a top speed of 29 knots, a cruising speed of 23 knots and a range of 4,000 nautical miles at 9 knots. The second yacht displayed this year at the Fort Lauderdale boat show is the first hull of the new 26.43m Marlow 80E series, successor of the successful Marlow 78 series. She follows the Marlow spirit, and offers ocean going capabilities and impressive range. Her twin Caterpillar C-32 engines give a top speed of 30 knots. Called Paws for Life, delivered for a repeat client of the yard, she accommodates eight guests in four double staterooms including a full-beam master on the lower deck.